^ 1.0 1.1 The Great Barrier Reef: a catastrophe laid bare. The Guardian. 2016-06-06 [2016-10-15]. ISSN 0261-3077 （英国英语）. ^ REEF 'AT RISK IN CLIMATE CHANGE'. [2007-07-12]. （原始内容存档于2007-08-01）. ^ Saxby, T.; Dennison, W. C.; Hoegh-Guldberg, O. Photosynthetic responses of the coral Montipora digitata to cold temperature stress. Marine Ecology Progress Series. 2003, 248: 85. doi:10.3354/meps248085. ^ Marimuthu, N.; Wilson, J. Jerald; Vinithkumar, N. V.; Kirubagaran, R. Coral reef recovery status in south Andaman Islands after the bleaching event 2010. Journal of Ocean University of China. 2012, 12 (1): 91–96. Bibcode:2013JOUC...12...91M. doi:10.1007/s11802-013-2014-2. ^ Rogers, S.R. Responses of coral reefs and reef organisms to sedimentation (PDF). Marine Ecology Progress Series. 1990, 62: 185–202. doi:10.3354/meps062185. ^ Kushmaro, A., Rosenberg, E., Fine, M., Loya, Y.; Rosenberg; Fine; Loya. l Beaching of the coral Oculina patagonica by Vibrio AK-1 (PDF). Marine Ecology Progress Series. 1997, 147: 159–165. doi:10.3354/meps147159. ^ Jones, R.J., Muller, J., Haynes, D., Schrieber, U.,; Muller; Haynes; Schreiber. 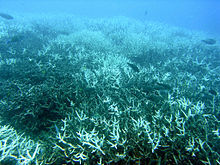 Effects of herbicides diuron and atrazine on corals of the Great Barrier Reef, Australia (PDF). Marine Ecology Progress Series. 2003, 251: 153–167. doi:10.3354/meps251153. （原始内容 (PDF)存档于2010-03-31）. ^ Hoegh-Guldberg, O.; Smith, G.J. The effect of sudden changes in temperature, light and salinity on the population density and export of zooxanthellae from the reef corals Stylophora pistillata Esper and Seriatopora hystrix Dana. Journal of Experimental Marine Biology and Ecology. 1989, 129 (3): 279–303. doi:10.1016/0022-0981(89)90109-3. ^ 10.0 10.1 Johnson, Johanna E; Marshall, Paul A. Climate change and the Great Barrier Reef: a vulnerability assessment. Townsville, Qld. : Great Barrier Reef Marine Park Authority. 2007. ISBN 978-1-876945-61-9. （原始内容存档于2014-01-25）. ^ Anthony, K.R.N. ; Kerswell, A.P. Coral mortality following extreme low tides and high solar radiation. Marine Ecology Progress Series. 2007, 151 (5): 1623–1631. doi:10.1007/s00227-006-0573-0. ^ Value of Coral Ecosystems. [2017-11-09]. ^ How dead is the Great Barrier Reef?. [2017-11-09]. ^ Chumkiew, Sirilak. Impact of Global Warming on Coral Reefs. 2011 [2014-02-27] –通过ResearchGate. ^ Huppert, Amit; Lewis Stone. Chaos in the Pacific's Coral Reef Bleaching Cycle. The American Naturalist. September 1998, 152 (3): 447–459. PMID 18811451. doi:10.1086/286181. ^ 大堡礁：珊瑚白化現象「令35%珊瑚死亡」. BBC中文新聞網. 2016-05-30 [2016-06-20]. ^ Plumer, Brad. The unprecedented coral bleaching disaster at the Great Barrier Reef, explained. Vox Energy & Environment. [2016-03-31]. ^ Done T, Whetton P, Jones R, Berkelmans R, Lough J, Skirving W, Wooldridge S. Global Climate Change and Coral Bleaching on the Great Barrier Reef (PDF). Queensland Government Department of Natural Resources and Mines. 2003. ISBN 0-642-32220-1. （原始内容 (PDF)存档于2011-09-27）. ^ Berkelmans R, De'ath G, Kininmonth S, Skirving WJ; De'Ath; Kininmonth; Skirving. A comparison of the 1998 and 2002 coral bleaching events on the Great Barrier Reef: spatial correlation, patterns, and predictions (PDF). Coral Reefs. April 2004, 23 (1): 74–83. doi:10.1007/s00338-003-0353-y. ^ Disturbance and the Dynamics of Coral Cover on the Great Barrier Reef (1995–2009).